Danny and his sister Anna strike a fun pose in their home in New Jersey prior to his ceremony. I love the way the natural light from the windows softens their faces and the pose. We photographed Anna's bat mitzvah a couple years before, where she had a sparkling party at the Collingswood Ballroom in New Jersey, with a Blue Man Group theme (it was actually Purple Man Group, and the show was spectacular!) It is wonderful to be able to have families use my photography services again, I just love repeat customers! There is a bond between us and a familiarity, and often the family looks to us again when the it's time for their children to get married. 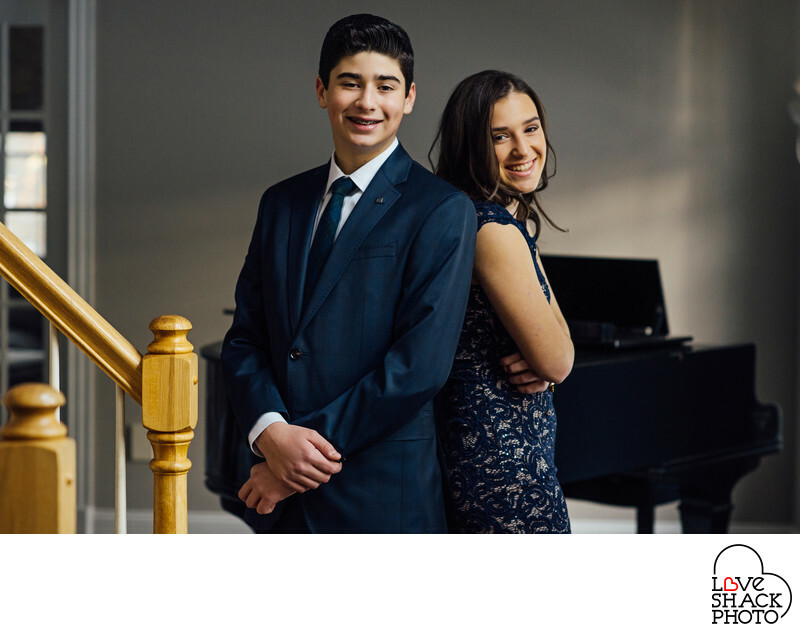 In these cases, it is so fun for me to have been at their mitzvah AND their wedding. Danny's bar mitzvah party later that evening was at the Fillmore Philadelphia, a large rock club that makes a perfect bar mitzvah party venue. Danny had a sports theme, with a lot of Under Armour gear, and the room was perfection due to the planner and decor specialist, Uncommon Events and Melissa Brannon. The room was brought to life further by the modern lighting from Eventions Productions. Location: 850 E Evesham Rd, Cherry Hill, NJ 08003.